2013 has been quite an eventful year for Google AdSense. And why not? It was also the year in which Google AdSense completed 10 years of service. Several improvements, new features and modifications were introduced by the AdSense team. In this article, we look back at some of the major improvements and new features announced in 2013. Google AdSense is an advertising platform where web publishers can place ad units on their websites and generate revenue from them. Webmasters get paid when visitors click or view ads placed on their websites. Payments come directly from Google in the form of cheque or EFT. Google AdSense is one of the largest and most trusted online advertising platforms used by webmasters and publishers all around the world. Thanks to Google’s strict screening process, only genuine publishers who publish quality content on their websites, can become an AdSense user. 2013 saw quite a lot of improvements in Google AdSense. Here are some of the most significant changes brought about this year. In July 2013, the AdSense team announced a new type of ad unit which could dynamically change its design depending on the viewer’s screen size and resolution. This feature enabled AdSense users to control the size of ads across different devices; the same way web pages are designed to have different layouts for different screen sizes. Below are the two key features of responsive ad units. Automatic adjustment of ad size based on available space: Google’s responsive ad code automatically calculates the required size dynamically according to the width of the ad unit’s parent container. Thus, if the parent container has a width of 30%, a 307×250 ad will be displayed on a 1024px wide screen; but the same code will display a 504×60 ad on a big 1680px wide screen. Dynamic ad sizes depending on screen orientation: Responsive ad units are compatible with website layout changes following a device orientation change. If you have responsive site whose elements change position due to a device switching from portrait to landscape or vice versa, new ads of suitable dimensions will be loaded. Responsive ads display different sized ads depending on screen size and orientation. However, Google also announced custom sized ads in December, just a couple of days back. Custom ad units allow users to create ad units with specified dimensions. That means you can set your own width and height for different ad units. There is, however, a limit to the maximum and minimum pixels for ad sizes. With custom sized ad units, publishers now have better ad management options with better utilization of ad spaces. Custom Ads are suitable for certain regional ad formats that are not supported in Google AdSense or if you want a custom size that may fit your layout better. If your website uses responsive design, it is better to use a responsive ad unit instead. Note: Custom sized ad units may have a limited inventory of display ads available, which could have a negative impact on your earnings. A recent comment by an official Google employee may suggest that the AdSense might start paying Indian publishers directly through electronic funds transfer. According to the post, Google is working to bring EFT to Indian publishers within the end of this year. If this is true, then it’s really great news. A few countries like India receive AdSense payments only by check, which is inconvenient for both the Google AdSense team and the publishers. Check payments include unnecessary processing fees for Google. As a result, payments are often delayed which could annoy publishers. Government laws restrict other forms of payment at present. However, if EFT is coming to India soon, that should be good news for the publishers. Google recently made several UI improvements to the AdSense web interface. It now provides a better overview of various ad related metrics. Also Google is slowly rolling out a different UI that’s quite similar to the Google Now Card View interface. 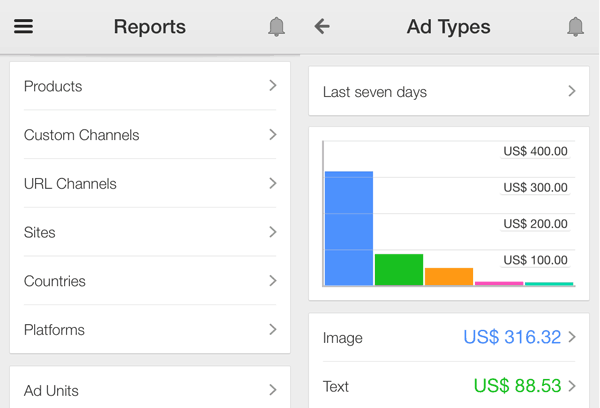 Google AdSense apps for iOS and Android received major overhaul this year. The latest version of Google AdSense apps on both platforms feature more detailed analytics, including CTC, CTR and RPM. Here is the complete change log for the new updates. More metrics: page views, clicks, CPC, CTR, RPM. Detailed charts for different metrics, dimensions and time periods. Additional reports: countries, products and platforms. Improved user interface and layout. These are the Google AdSense improvements we have encountered from this year. If there are any other features of AdSense that we have missed here, put your comments in the space below.